CH716 / VU374 / FFS10 / SFFS 2128 / W&R477 / Cha575 Come and find the quiet centre (Shirley Murray) A good song for the beginning of worship. I would prefer to sing this to one of the more traditional melodies offered (Tune 1 in FFS) or BEACH SPRING (TiS 493). Lyrics. New words to old tunes. *AA085 Let justice roll down like a river (Colin Gibson) Excellent song, and very easy to sing. Lyrics and sheet music. Good for kids. *AoV1-030 / GA213 / G(II)282 / GC386 / GC(II)405 / G(3)484 / Lau842 Come back to me / Hosea (Gregory Norbet) Quite beautiful song of return to God. Nice sung sound sample. Lead sheet. ATOK 331 Turn to me with all your heart (John Ylvisaker) I like this one, unfortunately I can't find lyrics or sound samples online. GA304 / G(II)283 / GC389 / GC(II)410 / G(3)478 / Lau193 Return to God with all your heart (Marty Haugen) "Return to God with all your heart, the source of grace and mercy" Verses may need a cantor. Lead sheet. Sound sample. *Tune In / NCYC '07: Forgive us now (Brown). 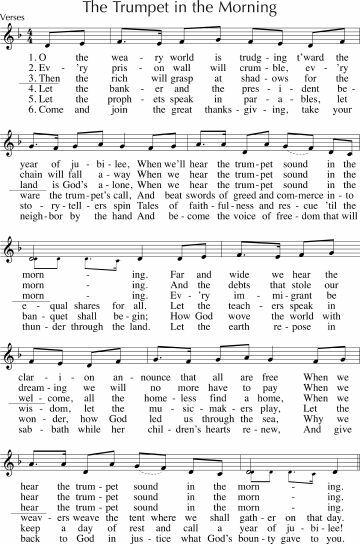 “As we forgive may we be healed, as we reach out….” An excellent ballad seeking forgiveness in a sinful world. Free downloadable songbook. VU109 / 82Hml-145 Now quit your care and anxious fear (Percy Dearmer) A lovely joyful tune for Lent. Good, realistic, although slightly old-fashioned words. "Arise, arise, arise and make a paradise!" This could be sung through the whole Lenten season. Lyrics. TiS 657 / CH263 / VU700 / A&M559 / AA50 / CP(E) 447 / Cha656 / SP242 God of freedom God of justice (Shirley Murray) Powerful lyrics. Can be sung to either TREDEGAR (new, but not too hard) or PICARDY (very familiar). New words to old tunes. Lyrics and sheet music. CH195 / StS053 / AA061 Here to the house of God we come (Shirley Murray) Good honest and challenging words and a simple, but unusual tune. Lyrics. CH488 / AA130 Teach us O loving heart of Christ (Shirley Murray) Good, powerful words seeking forgiveness for those things we have not done or said. The tune is new, but fairly simple. Lyrics. BUC Song Project Broken (Elaine Loukes) A gentle song for tired pilgrims. Iona (SBL) / MV068 / G(II)405 / GC581 / GtG578 / PfAS009A Kyrie Guarany / On the poor, on the poor (Pablo Sosa / Guarani people) A simple Kyrie from Paraguay; This is our current favourite at Brunswick. The English translation varies depending on the source (we don't sing On the Poor). Sound sample (track 12). Good for kids. *Online Resource Open my heart (Ana Hernandez) A beautiful 3 part chant, which also works as a single part chant. Sheet music. Youtube of the song being taught and sung in 3 parts. Tune In / NCYC '07 Forgive us now (Dave Brown) An excellent ballad. "Forgive us now, O mother love for all the idols we have built, For all the time we’ve worshiped there in company of dark despair. Forgive us mother of all hope”. Free downloadable songbook and sound samples. 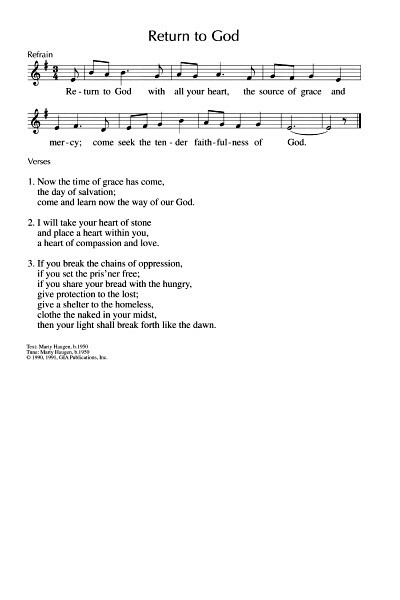 MV015 / GA186 Holy Sacred Spirit (Monica Brown) Gentle chant, which would work well at the start of the service. Can be used without the cantor part. "Holy Sacred Spirit, breathe your breath on us". Youtube (VERY SLOW) Good to help kids settle. *AoV1-158 / GA438 Create a new heart Holy Lord / A new heart for a new world (Monica O'Brien / Trish Watts) Very simple melody, excellent words "Create a new heart Holy Lord, beckon our lives through your word, open our eyes to your call, United as one for your world". Lyrics and slightly odd sound sample. 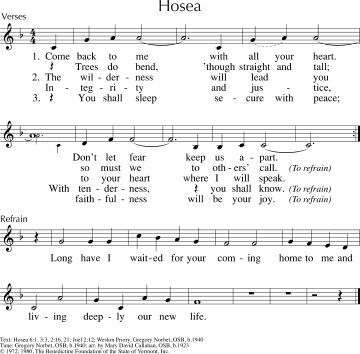 TiS 712 / AoV2-021 / ATE 269 / The tide has turned songbook Create in me / us a clean heart O God (Digby Hannah) A big favourite in our congregation, and a big favourite of mine. Lyrics & sound sample. 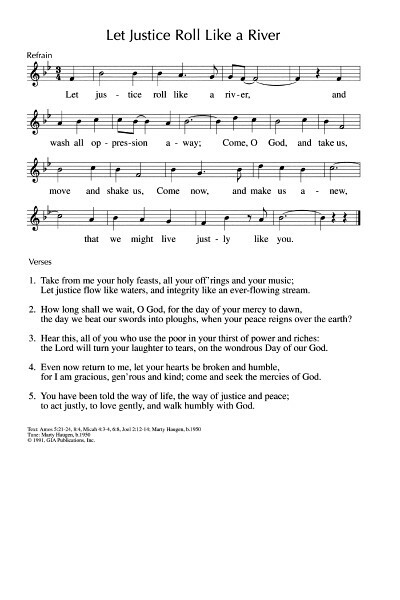 GA040 Create in Me a Clean Heart O God (Monica O'Brien) Nice refrain and simple cantor part for this Psalm. GtG423 / W&R378 / PfAS051H Create in Me a Clean Heart O God (John Carter) A very simple, and repetitive version of the Psalm. Lyrics and sheet music sample. GC(II)409 / G(3)477 Lord Jesus Christ son of the living God (Carol Browning) A simple chant based on "The Jesus Prayer" with a beautiful (and optional) cantor which is really worth using. Nice chords! Nice sound sample and sheet music sample Sound sample Lead sheet. Cha743 Create in me a clean heart O God (Carl Mueller) Very simple refrain based on a choral work, with a responsive reading. PfAS051I Lord Have Mercy (Kathleen Hart Brumm) A simple call and response Kyrie. Good for kids if you sing it with some energy. GtG431 / SFFS 2134 Forgive Us Lord / Perdon Senor (Jorge Lockward / Raquel Mora Martínez) Call and response prayer of confession. NCH784 Create in Me a clean heart (Emma Lou Diemer) Easy to sing. Nice words. *Online Resource Create in Me a pure Heart O God (Bruce Harding) A nice round, with an optional descant part. Good for kids. Sample sheet music Purchase here (note that the sound sample is for a different song). ATOK 399 Holding out your hand (Gerry Holmes) I like this one. Good for kids. Psalm Project - Sharing the Road Wash Me Clean (Richard Bruxvoort-Colligan) A nice, gentle reworking of the Psalm. Might be good to ask a musician to sing this one. Available here. *TiS 729 / Iona (HSNW) Jesus Christ, Son of God have mercy upon us (John Bell) A very very simple call and response chant. ATOK 354 / ELW801 / SFFS 2152 / GtG695 / SP&P128 / W&R373 / PfAS051A / ZSS178 / Srce95 / MP069 Change my heart O God / Cambiame Senor (Eddie Espinosa) A mushy old favourite. Online Resource Create in Me (Tom Keesecker) A lovely choral piece. Listen to the full sound sample, it just gets better and better. Sound sample, PDF sample, and purchasing options. Be reconciled. Despite afflictions, Paul has much; having nothing, but possessing everything. *CH527 / A&M717 / SP290 / 82Hml-593 Lord make us servants of your peace (James Quinn) A nice alternative to "make me a channel of your peace". This is sung to the very familiar tune "O Waly Waly". It is also sung in the plural (us and we rather than Me and I), which is nice too. Lyrics can be found here. NCH495 / HPP443 / GtG761 / PH343 / W&R581 / Cha453 Called as partners in Christ's service (Beecher) A good song of commitment - particularly good if you are commisioning people to new roles this week, and good for any other service too. Sung to a standard tune. *WoV659 O Sun of Justice / Jesu Dulcis Memoria (Plainsong) I really like these words. They can also be sung to TALLIS CANON if you get nervous about Plainsong. New words to old tunes. ATOK 390 Put on love every day, never hide your love away (Walker) A fun song for kids; probably hard to fit into a solemn Ash Wednesday service, though! Good for kids. Don't show off about fasting etc. TiS 686 / ATE 292 Lord Jesus we belong to you / Because we bear your name (Robin Mann). A straightforward song with a refrain of "because we bear your name". Lyrics. *Taizé / TiS 739 / AoV2-041 / ATOK 404 / VU290 / GA269 / SFFS 2054 / GtG820 / G(II)451 / GC639 / GC(II)626 / G(3)733 / CP568 / W&R421 / URW388 / Lau947 / LUYH444/ VF088 Nothing Can Trouble / Nada te turbe (Theresa of Avila / Taizé) Excellent and quite well known Taizé chant. Spanish lyrics are not too hard for non-Spanish speakers. Sheet music, sound samples, lyrics and translations. Good for kids. NCH186 / VU105 / G(II)280 / GC381 / GC(II)392 / G(3)468 / RS539 / URW172 Dust and ashes touch our face (Brian Wren). The words to this hymn are very challenging. The tune is good. Lyrics and sheet music. G(3)489 Sign us with ashes (Laura Bringle / Tony Alonso) A good refrain with verses that you can use when ashes are signed. Sheet music sample. *ATAR626 / VU113 To the desert Jesus came / Together through the valley (Linnea Good) A good contemporary hymn, with a quite classically beautiful tune, for the start of Lent. A song about going together through the wilderness of Lent to Easter. Recorded Music Beautiful Things (Gungor) A sweet and very popular song. "You make beautiful things, you make beautiful things out of the dust".... Not so much a congregational song, although it's not difficult, unless everyone knows it well. It's not hard to play, so if you have good musicians, they may like to give it a go. It could also work to just sing the chorus as a chant. Youtube with lyrics. Guitar instructions. Good for teenagers. *Online resource With these ashes (Douglass) A lovely simple song that would work well to be sung during the imposition of ashes. Sound sample. PDF (thanks to Kathy for sharing this). Online resource We are children of the Earth (Richard Bruxvoort Colligan). This song is based on Psalm 90, and would be appropriate for the anointing with ashes, or other reflective moments in your service. Sound sample, lyrics and an entire Ash Wednesday order of worship. You may also like to use a Kyrie. Here's a list of them. Great suggestions. I also love "Ashes" which is in the ELW. Great suggestions! I have a few others. All can be found in Gather 3. Is it ok to sing holy darkness in communion for ash Wednesday?